McKeen car Roslyn of the Northern Pacific Railroad. Countless McKeen cars ended up being re-engined with a variation of drive mechanisms. These included diesel-electric, gasoline-electric, gasoline mechanical or even steam power. Most of the McKeen cars had the distinctive wind splitter that pointed to the aerodynamic front end and rounded tail. The porthole windows were also a McKeen trademark, they were adopted allegedly for strength after the production of the 7th car. The dropped central door, had been also present on the majority of the cars. They were offered at two lengths, 70 feet and 55 feet, either could have been fitted out with a mail area or an express area that was ahead of the center doors, a smaller express/mail area or the car could have been seated for a maximum capacity of 64 or 105. Most of the issues that were experienced with the McKeen cars had involved the drive train and power plant. As with several other attempts to try and bring marine engine technology to the rails, engines that would be reliable on the stable platform of a ship when they are attended to by experienced technicians. The operators have proved less so when they were exposed to the vibrations, the indifferent maintenance and less careful handling was found on the railroad. The starting of the engine was an issue on the earlier cars. There was no independently powered compressor; the compressed air starting had relied on the constricted reserves of the car’s reservoirs. There were several reports of the cars being started by getting pushed or towed by a locomotive or even horses. 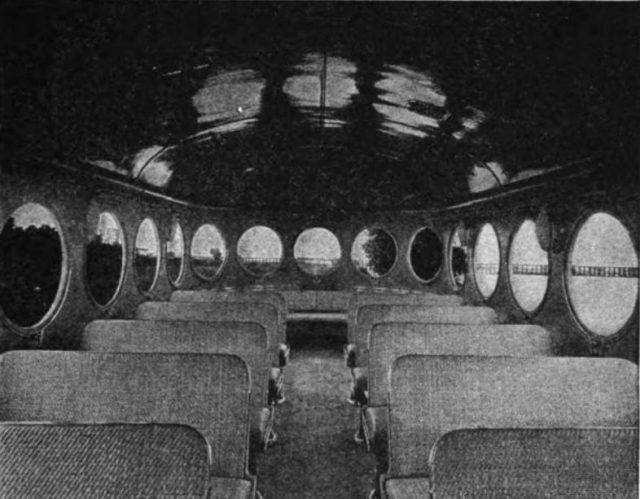 Interior of a McKeen car. This was after the compressed air had ran out. The later cars were fitted with an independent gasoline driven compressor which could be hand started. The lack of not having a reverse gear also caused issues. The engine would have to be stopped, the camshaft would shift to a set of reverse cams, and then it would start in the opposite direction. This had been an acceptable shipboard, perhaps, yet deeply disliked by the railroad operators. Some accounts exist of the engineers’ elaborating schemes to avoid the necessity to reverse. The transmission had been a normal problem, the clutch did not appear to exist which joined the ability to with stand 200 horsepower (150 kW) on a continual basis. It had the ability to provide a smooth start. The competitor, GE’s cars, used an electrical transmission, or a hydraulic torque converter was used on the large majority of the successful internal combustion engine rail vehicles since then. Several operators found that the McKeen car was lacking power and traction, the latter was not surprising since only one of the four axles were being powered. 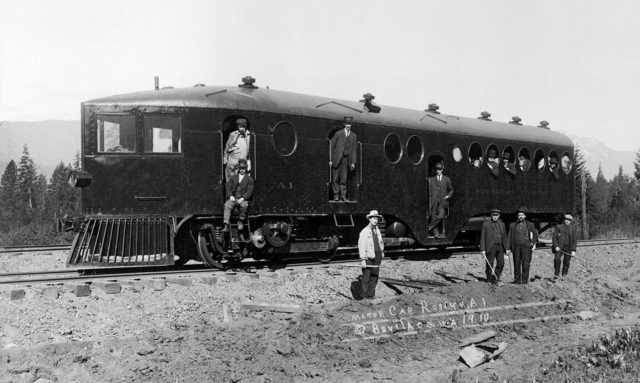 The McKeen had been popular from the year of 1915 until the 1930’s throughout the US, and the cars were featured on the Southern Pacific and Union Pacific. The two McKeen rail motors were bought and delivered to the Victorian Railways located in Victoria, Australia in the year of 1911. They had served throughout their life as a rail motor that ran from the Ballarart to Maryborough and Hamilton to the Warnambool services. 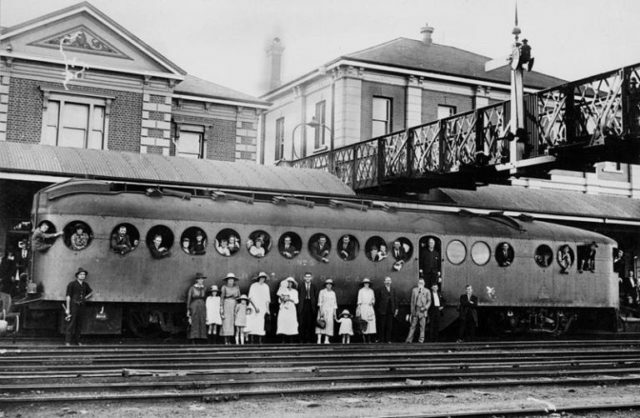 It had briefly served in the months of March and April in 1913 to the Maryborough to St Arnaud services. McKeen car of the Victorian Railways at Wodonga, c.1912. The rail motors had a poor record with several break downs; they only were around at rail motors for three years. In the year of 1919, they were de-engined and changed to passenger cars being numbered as ABCL 1&2. This was for use on the Altona line up until they were scrapped in August of 1926. The Victorian Railways, was the government run system of the state of Victoria in Australia. Two McKeen cars were ordered in the year of 1911, they were delivered in 1912. These had been the only broad gauge cars, created to the VR gauge 1,600 mm (5 ft 3 in). They were fitted with hooks, buffers and chain couplers. They were created with the rounded nose body type, instead of the knife nose. Since the VR stations had car level platforms, the common dropped entrance way raised into the roof. In the year of 1911, the Queensland Railways to the state of Queensland, Australia had ordered a total of five McKeen cars. They were delivered on the date of May, 1913. They had been to the QR gauge of 3 feet 6 inches, and were the only narrow gauge in McKeen cars. They had been issued with the running number though 1 and 5. The cars, not like most, had the exact size of wheels on both of the axles that lead the truck and a chain drive linking them. This made all of the four wheels drive. These cars were around 62 feet and 4 inches long and had originally seated 75. This had been soon reduced to 69 seats by dividing the car into a non-smoking section that would seat 55 and the smoking section seated 14. The five cars were based at the Wolloongabba for a majority of their lives, and handled the services to the Brisbane suburbs of Sunnybank and Corinda also between Manly and Cleveland. The cars proved not to be more reliable in Queensland than anywhere else. By the year of 1920, the No.1 car was out of service. Nos.2 and 5 had been modified as Day Inspection and Tourist cars, with luxury accommodation for 32 of its passengers. They were still very expensive to run, estimated to be doubled the running costs of the steam hauled train. The Great Depression had finished them off, and the five cars were withdrawn between the years of 1929 and 1931. One of the preserved cars is at the Nevada State Railroad Museum. This car used to run on the Virginia and Truckee Railroad. Being fully rebuilt, as of the date September 2010, it runs during special events. The Nevada State Railroad Museum was able to restore a full McKeen car, the Virginia and Truckee Railway Motor Car 22, a 1910 manufactured 70-foot car. McKeen car of the Queensland Railways. This had been one of the last McKeen cars that are still running with the original motor. The last run it did was in September of 1945, and its body had been sold in 1946 for the service of a roadside diner. It was later to be used for a plumbing supply store that was in Carson City, Nevada. It was donated to the Museum in the year of 1996. The first run was on the date of May 9th, 2010, the car’s hundredth anniversary of the construction. The original power plant did not survive, and no other of the McKeen engines were able to be located. Consequently, a modern engine was able to be fitted to permit the car to operate up to the original maximum velocity. The completely restored McKeen motorcar had been put back into operation on the date of May 9th, 2012. This was right on schedule for the 100th anniversary. The motorcar is currently being used at the Nevada State Railroad Museum that is located in Carson City. They use it for special events such as Nevada Day and 4th of July. The NSRM also owns the remains of a second McKeen car that was converted into a diesel-electric switching locomotive. Another McKeen Body, construction number 83/103, still survives in Anchorage, Alaska. It had originally belonged to the San Diego Cuvamaca & Eastern Railroad but was later sold to the Yuma Valley Railroad before it arrived in Alaska around the time of 1921. It was re-engined and round nosed in the year of 1924, being converted to an unpowered trailer during the year of 1935. Finally, it was able to retire during the late 1940’s after it served in the 714thRailway Battalion throughout the duration of WWII. Two unpowered McKeen trailers are currently the only survivors, one is located in a storage shed inside St.Helena, California, while the other is located at the Illinois Railway Museum. You are able to follow the McKeen Motor Car Company Historical Society on a Facebook page.